Many Republicans and Democrats associate negative characteristics with members of the other party – and positive traits with their own. But the specific criticisms Democrats and Republicans have of each other vary. And on several of these traits, a majority of partisans say Republicans and Democrats aren’t much different from the public as a whole. Of the five characteristics asked about, Democrats are particularly likely to say Republicans are closed-minded: Fully 70% say Republicans are a lot (35%) or somewhat (35%) more closed-minded compared with other Americans; 23% say they are about the same as other Americans on this dimension; and just 5% view Republicans as more open-minded than other Americans. Democrats are less likely to opt for other negative descriptors of Republicans: About four-in-ten (42%) say GOP members are more dishonest than other Americans, while about half say they are about the same and 5% say they are more honest. Though half or more of Democrats do not think of Republicans as different from other Americans when it comes to morality, intelligence or work ethic, roughly a third say they are more immoral (35%) and more unintelligent (33%); just 18% say Republicans are lazier than other Americans (9% say they are more hardworking). Though no one negative trait stands out to the same degree among Republicans in their evaluations of Democrats, Republicans are somewhat more likely to lodge criticism in several areas: Roughly half (52%) think of Democrats as more closed-minded than other Americans, and about as many say Democrats are more immoral (47%), more lazy (46%) and more dishonest (45%). Partisans also have positive associations with members of their own party, and these largely mirror the negative stereotypes of the other party. Almost six-in-ten Republicans (59%) say Republicans are more hard-working than other Americans; just 37% of Democrats say the same about fellow Democrats. And while about half of Republicans (51%) see members of their party as more moral than other Americans, a smaller share of Democrats (38%) say this about their co-partisans. Nearly as many Democrats say Democrats are more open-minded than Americans as a whole (67%) as say Republicans are more closed-minded (70%). Only about a third of Republicans (32%) think other Republicans are more open-minded. Nearly two-in-ten Republicans (18%) say Republicans are more closed-minded than other Americans, the largest share to ascribe a negative trait to those in their own party. Republicans and Democrats are equally likely to say those in the other party are unintelligent (32% vs. 33%, respectively) and to view members of their own party as intelligent (43% vs. 40%). Participation in politics can take a variety of different forms. More than half of Republicans (55%) and roughly four-in-ten Democrats (41%) report following what is going in government and public affairs most of the time. However, only 5% of Republicans and 8% of Democrats say they have worked or volunteered for a political campaign over the past year. 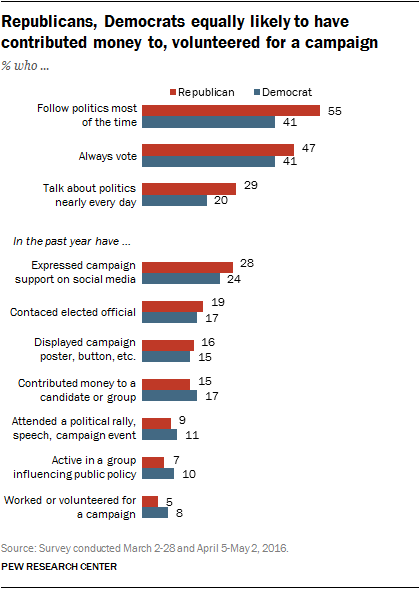 Contributing money to candidates or groups working to elect candidates is somewhat more common (15% of Republicans and 17% of Democrats have done this in the last year), while roughly a quarter of Republicans (28%) and Democrats (24%) say they have publicly expressed support for a political campaign on Facebook, Twitter or other social media. Democrats and Republicans participate at roughly equal rates across a range of different activities, and those who are more politically engaged are more likely to associate negative traits with the other side and more likely to associate positive traits with their own. About one-in-four partisans hold none of these negative stereotypes of those on the other side (25% of Republicans and 22% of Democrats). Across most measures of political participation, these individuals with no negative partisan stereotypes were less likely to participate in politics. Conversely, those who associate three or more negative traits with people in the opposing party (as 37% of Democrats and 44% of Republicans do) participate in politics at the highest rates. For instance, while just 5% of Republicans who do not associate any negative traits with Democrats have contributed money to a candidate or group working to elect a candidate in the past year, that rises to 14% among those who hold one or two negative stereotypes of the opposing party, and to 22% among those who ascribe three or more of the five negative traits to Democrats. Similar patterns are evident for other types of political activity, such as contacting elected officials and publicly expressing support for candidates, and are seen among both Democrats and Republicans. For many Republicans and Democrats alike, the extent to which they might get along with a new neighbor might depend on who that neighbor is – and their partisan affiliation. 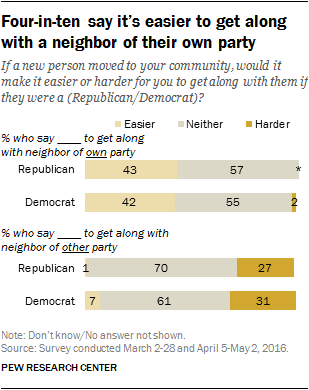 Majorities in both parties say the party affiliation of a new neighbor wouldn’t make it any easier or harder to get along with them, But roughly four-in-ten Republicans (43%) and Democrats (42%) say it would be a lot or somewhat easier if the newcomer “were a Republican” or “were a Democrat,” respectively. Comparable majorities of each side (57% of Republicans, 55% of Democrats) think it would be neither easier nor harder to get along with a newcomer who identified with their own party. Very few think it would be harder to get along with a member of their own party who moved to the community. 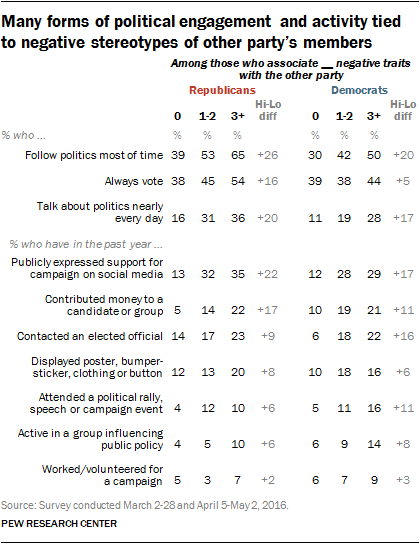 But just as some find it easier to get along with those who share their partisan affiliation, some say it would be more difficult to get along with a member of the other party: 31% of Democrats say it would be harder to get along with a new person in the community if they were a Republican, while nearly as many Republicans (27%) say it would be tougher to get along with a new Democratic neighbor. About six-in-ten Democrats (61%) say having a new neighbor who is a member of the GOP would make it neither easier nor harder to get along, and 7% say it would be easier. Seven-in-ten Republicans (70%) would react neutrally toward a new Democratic neighbor, and just 1% say it would be easier to get along with them. Highly engaged partisans (those who vote regularly, and either volunteer or contribute to campaigns) are far more likely than those who are less engaged to say it would be easier to get along with a co-partisan – and harder to get along with someone from the other party. In thinking about a new person in the community, identical majorities of both Republicans and Democrats who are highly engaged (61%) would find it a lot or somewhat easier to get along if the person were a member of their own party. Fewer of those who are less politically engaged feel the same way (40% of Republicans and 38% of Democrats), with about six-in-ten saying it would be neither easier nor harder. Similarly, those with higher levels of political engagement are more likely to express skepticism about being able to get along with new neighbors identifying with the other party: 44% of highly engaged Democrats and nearly as many highly engaged Republicans (38%) say it would be harder to get along with a new person in the community if they were a member of the other party. By comparison, only about a quarter of less engaged Democrats (29%) and Republicans (25%) would find it harder to get along with a neighbor of the opposing party. 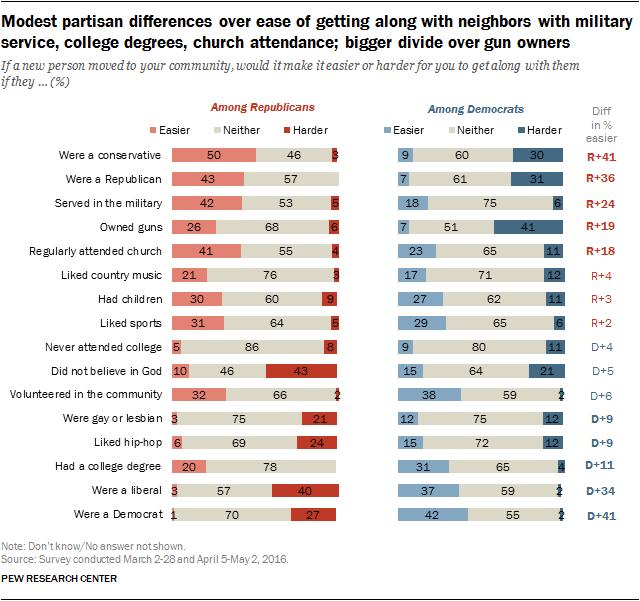 Republicans and Democrats show some distinctive preferences toward other potential characteristics of new neighbors as well, from gun ownership to belief in God – though in nearly all cases, majorities say these traits would not have an effect on their ability to get along with a new neighbor. Republicans are about twice as likely as Democrats to say it would be easier to get along with a new person in the community if they had served in the military (42% vs. 18%) or regularly attended church (41% vs. 23%). Still, most Democrats say these traits would not have much impact on their ability to get along. About a quarter of Republicans (26%) say it would be easier to get along with a new neighbor if they owned guns, while just 6% say it would be harder; 68% say it would not make a difference. By contrast, 41% of Democrats think it would be harder to get along with a new neighbor if they owned guns and just 7% say this would make it easier to get along (51% say neither). Among Republicans, about as many say it would be harder to get along with a new neighbor who did not believe in God (43%) as say it would be neither easier nor harder (46%). Republicans are twice as likely as Democrats to find it hard to get along with someone who did not believe in God (43% vs. 21%), while Democrats are nearly as likely to say it would be easier to get along with a non-believer as to say it would be harder (15% vs. 21%). About three-in-ten Democrats (31%) and somewhat fewer Republicans (20%) say having a college degree is something that would make it easier to get along with a neighbor, though clear majorities in both parties say this would not impact their ability to get along. Neighbors who like sports, have children or volunteer in the community are viewed as easier to get along with by more than a quarter of Republicans and Democrats alike. In both parties, relatively few say these characteristics would make it harder to get along with a neighbor, while most say they would not matter much.